Ah, so you’ve planted a ton of tomatoes this spring and now you wait. Well, if you happen to have too many tomatoes and you don’t know what to do with them, here’s a great idea: dry them! 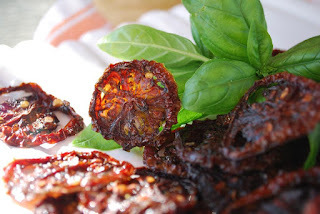 Dried tomatoes are so versatile that you can literally add them to hundreds of recipes. From pizza, to pasta sauces, dried tomatoes add a concentrated touch of tomatoey goodness that instantly perks up any dish. And have you seen the prices for commercially dried tomatoes in the store?! The best thing about this recipe is you don’t need any fancy schmancy dehydrating equipment, just an oven and patience will do. Once dried, you can store these delicious little morsels in a ziplock bag in the freezer for 6-9 months. That is if you don’t eat them all first! They're won-der-ful! Leave skin on and cut tomatoes into thin slices. Place tomatoes in the oil mixture and refridgerate for at least 2 hours to overnite. Set oven on 200 degrees. Take tomatoes out of mixture and spread on cookie sheet. It's OK if they touch. They will need to oven dry for about 14 to 16 hours (depending on amount of tomaotes). Size of pieces will determine time. For example, put them in the oven about 7pm and get them out the next morning around 10:30am. The tomatoes are done when they have a leathery feel to them. There usually is some oil left in the cookie sheet, which I blot off with a paper towel. Cool and lay dried tomatoes on paper towels to absorb any remaining oil. Store in ziplock baggie in the freezer for 6-9 months. Ohiomom, these are truly a treat! I make these once or twice a year, depending on necessity, and use them on pizzas, pestos, pastas, sandwiches, salads, sauces...and on and on! I also like that I KNOW there aren't any preservatives used for these little darlings, and their flavor....it's like tomato candy! 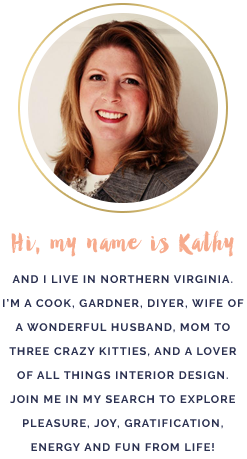 Kathy, they look good and sweet. I often dry tomatoes. And every time I do, I eat them right on the spot. like candy. They never make it to dinner. Sol, yes, they are THAT good! I have a tomato pesto recipe that I'm dying to try with these loverly morsels. Never tried drying tomatoes...it sounds very interesting and tasty. I'll definitely try it! Great pictures. Pickled Asparagus: Tis' the Season!